From a leaping interception to a fumble recovery to a fake punt conversion play, Friday’s district-opening football game between Hillsboro and Marion had its share of momentum swings and excitement. 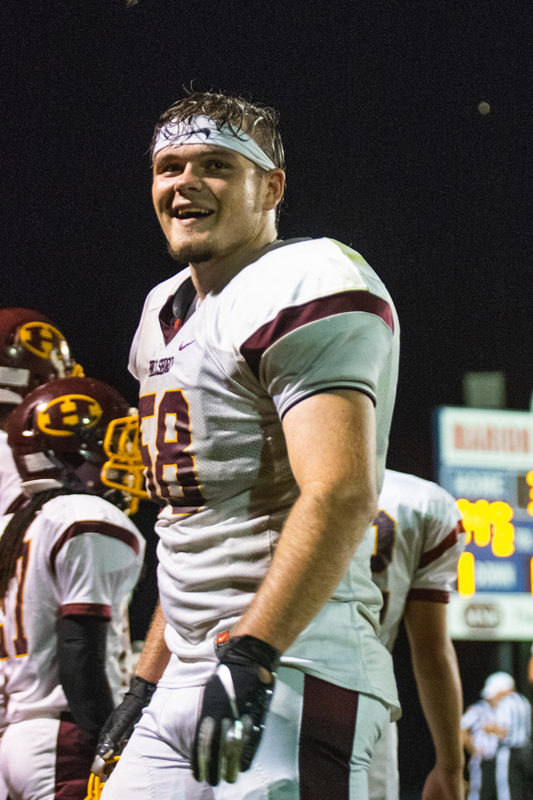 But it was Wes Shaw’s late-game heroics in snagging an 82-yard pick six that stole the show and inked an 18-14 victory for Hillsboro in a game Marion led a majority of the second half. Through the first three quarters, the teams traded blow for blow. After a scoreless first quarter, Hillsboro struck first when Brooks Gardner rushed untouched for a 2-yard touchdown to cap a 58-yard drive. The two-point conversion attempt failed, and with 2:37 left in the half, the Trojans enjoyed a 6-0 lead. Marion answered on its next possession. Sam Zinn hauled in a 54-yard pass from Chase Stringer, setting up a 1-yard touchdown run by Stringer with 40 seconds left in the half. The two-point conversion attempt failed, and the teams entered halftime deadlocked at 6-6. 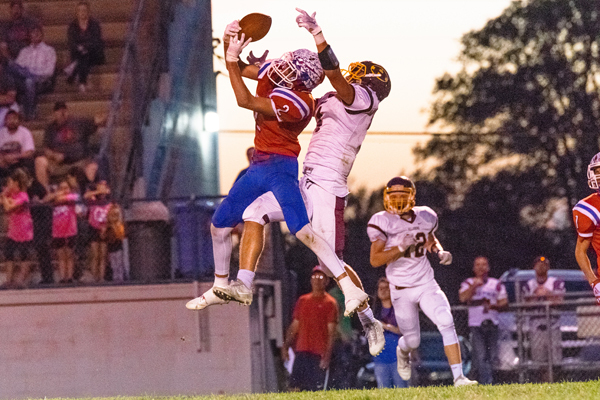 The second quarter also included a leaping interception by Zinn as Hillsboro was driving, as well as a fake punt pass completion from Zinn to Stringer. Marion opened the second half by marching methodically downfield and scoring on a 22-yard touchdown pass from Stringer to Eli Hett. 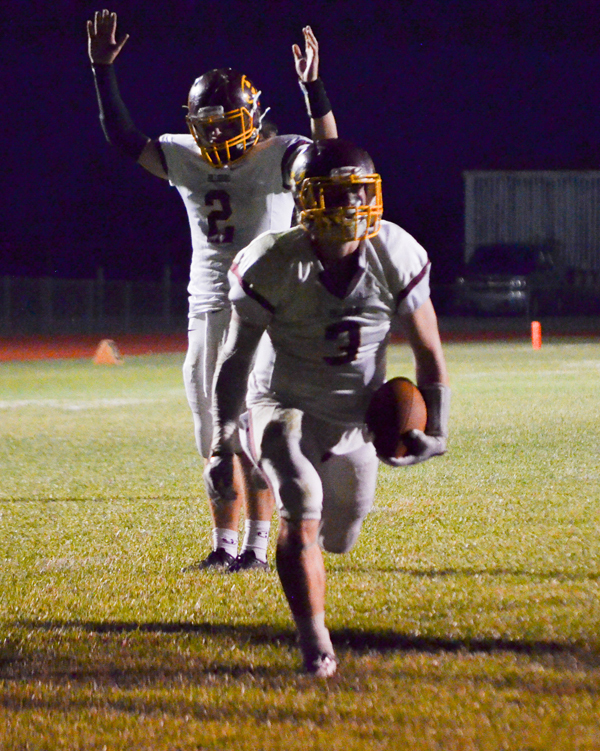 Colton Mercer’s two-point conversion run made it 14-6 at the 8:21 mark, silencing the visiting crowd. But with a fire lit beneath them, the Trojans responded quickly. Matthew Potucek returned the kickoff to the Warrior 40-yard line, and not long after, Hanschu completed a 20-yard touchdown strike to Caleb Potucek. The two-point conversion attempt failed, and the third quarter ended with Marion clinging to a 14-12 lead. Marion fumbled the ball away in the red zone early in the fourth quarter, but Hillsboro could not capitalize and punted. A 40-yard pass completion from Stringer to Zinn put Marion at the Trojan 11-yard line. But Hillsboro’s defense held, setting up Shaw’s fourth-down interception return that gave the Trojans new life and the lead with 3:23 to play. Marion got the ball back with 3:16 left in the game, but Hillsboro’s defense, bolstered by a tackle for a loss by Gardner on third down, forced a turnover on downs after a fourth-down pass completion to Evann Heidebrecht came up just short, and the Trojans ran out the final minute and a half to claim the four-point win. “Obviously, you play a team like Marion, you have to be responsibility sound the entire time, assignment sound,” Metzinger said. “We finally figured out how to do it and how to be where we needed to be, and thankfully it was in critical times, critical situations. Marion outgained Hillsboro in yards of offense, recording 381 to Hillsboro’s 202. For the Warriors, Stringer was 11-for-16 through the air for 160 yards and one touchdown. He led the team in rushing with 25 carries for 102 yards and one touchdown. For the Trojans, Hanschu was 5-for-11 for 68 yards and one touchdown. He led the team in rushing with 17 carries for 86 yards.